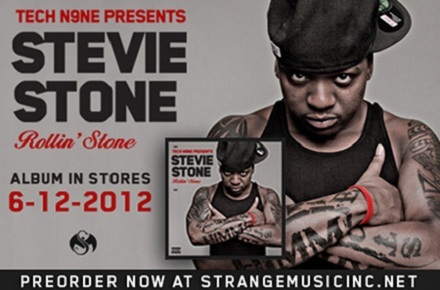 “Perfect Stranger” is dedicated to you, the Strange Music fans that have embraced Stevie Stone and the rough and rugged sound he brings to the greatest independent label in the world. Filmed on the one-year anniversary of his signing to Strange Music, “Perfect Stranger” from Stevie’s upcoming Rollin’ Stone is a celebration of the new place that he calls home. In this video we see Stevie Stone explain the importance of the song and how it relates to the Strange Music fans across the globe. “Perfect Stranger” is Stevie’s way of giving back for all the undying love and support that he has received since he allied with the Snake and Bat. When did you first become a fan of Stevie Stone?